Description: The most distinctive feature of the Lady Amherst’s pheasant is the long grey barred tail, reaching lengths of 80cm (31.5ins), and the black and white barred ruff of the male. A colourful body of green, blue, red, white, and yellow plus a metallic green crown, red crest and black and silver face completes the description of the male while the female is a mottled dark to reddish brown with dark bars and a lighter buff underside. 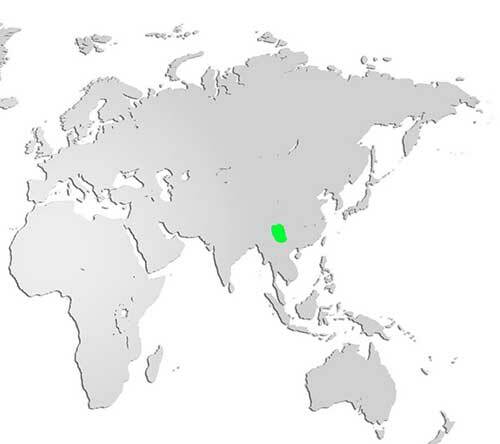 Distribution and Habitat: Native to southwestern China and northern Burma (Myanmar). William Pitt Amherst, Governor General of India (1823-1828), introduced them to England and there have been other attempts at introduction around the world. Normally inhabiting bamboo forests and thickets, these birds tend to run but can fly if they need to, roosting in trees in the night to avoid predators. Diet: Lady Amherst’s pheasants eat a varied diet of seeds, roots, leaves, insects and other small invertebrates like snails and worms. Life Cycle: Breeding begins in May with males displaying by fanning their ruff and calling in order to win several female mates. Typical clutch size is 6-12 eggs and incubation lasts about 23 days. 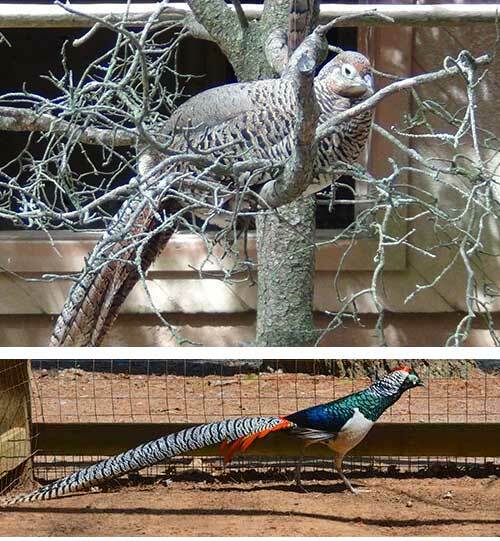 Lady Amherst pheasants will mate with golden pheasants and hybrids are very common, but discouraged by many breeders. Did you know? This pheasant was named for Countess Sarah Amherst, wife of William Pitt Amherst, Governor General of India.